You are here: Home » Leap into Savings at ChefUniforms.com! 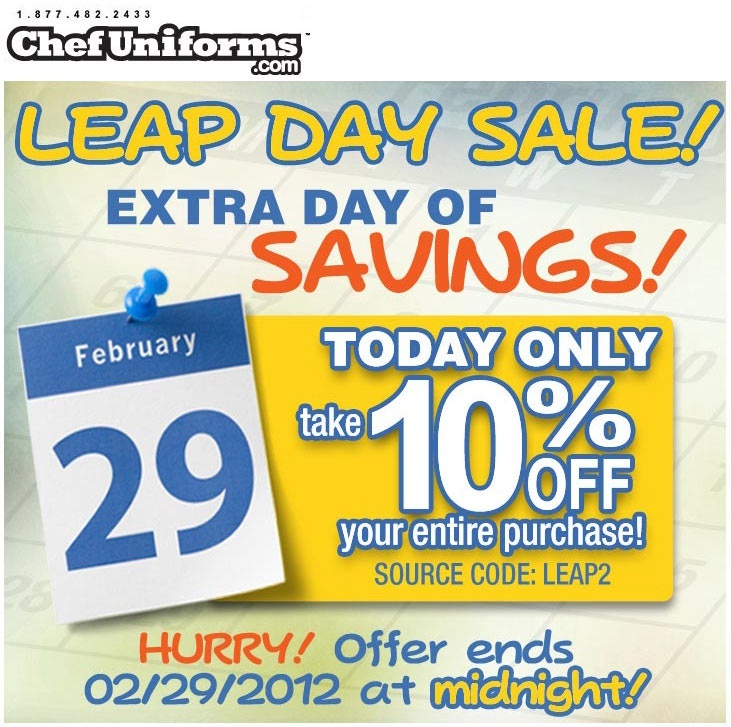 Leap into Savings at ChefUniforms.com! Happy Leap Day to all of our loyal readers, customers and fans! This day comes around only once every 4 years, so in honor of Leap Day, and as a big thank you, we’ve decided to give you all a gift… the gift of savings! For today only, Save 10% on all of your orders! But hurry, this offer ends tonight (2/29) at midnight! To save, simply Like us on Facebook, click the link on our wall, and start shopping for those chef coats! ← ChefUniforms.com wants to send you to the NRA Show 2012!